In-wall cable management kits give you everything you need to run your home theater cables behind your wall in one simple box. Staying compliant with fire and electrical codes can be complicated, but if you use what comes in the box (or a code-friendly alternative) and follow the instructions carefully, you’ll have a clean-looking home theater, without any of those pesky fire hazards. This may not be an option that’s available for everyone (sorry renters), and it requires a little bit more effort than wrapping cables with velcro. But it can be super worth it. If you have a jumble of cables laying haphazardly behind your entertainment unit, it’ll be an ugly mess (and maybe a fire hazard), but ultimately, no one’s going to come yell at you for it. That stops being the case once you run cables behind your walls. At that point, you’re making modifications to the structure of the house itself and can run afoul of electrical and fire codes. At best, this could mean trouble the next time you get an inspection (like when you sell your home). At worst, it could mean problems with your insurance if there’s a fire or harm to you and your family. A power outlet extension with building-safe wire: Under no circumstances should you be running the power cables to your TV behind the wall. These aren’t up to code and they’re fire hazards to boot. Instead, a wall kit will put a power outlet directly behind your TV and run cable-safe wire down to a plug where you’ll attach an extension cable. The only power cable you should run behind your wall are ones that come in a code-friendly kit. An extension cable to run to an existing outlet. 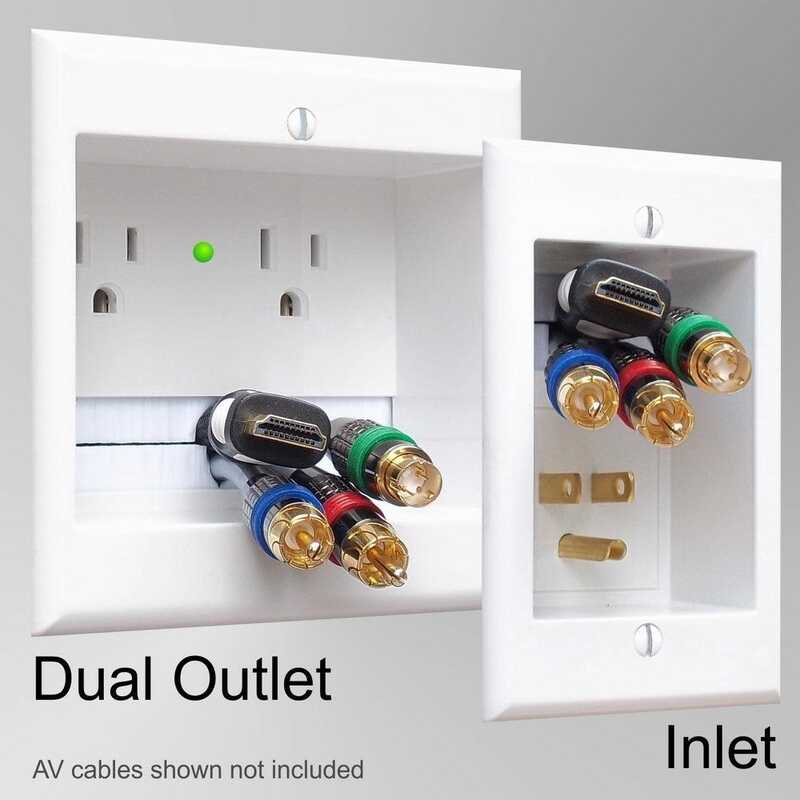 The included extension cable, connected to the lower port behind your entertainment unit, runs outside the wall to an existing power outlet in your home. This way, you don’t have to cut into existing wiring or do comparatively riskier electrical work just to add an outlet behind your TV. A cable passthrough port. This is basically a big hole in the wall plate that lets you stick cables of any size and shape through. This can include HDMI, audio, or any other cables you might need. It’s important that these cables be rated for use in walls, since it will be very hard to remove them once the whole kit is installed. Wall-safe HDMI cables (included or buy your own): Some kits will include properly shielded HDMI cables that are safe to run behind your wall. If your kit doesn’t include them, you can always buy your own. Amazon sells CL3-rated HDMI cables for comparable prices to their non-wall-rated counterparts. If your kit doesn’t have any wall-rated HDMI cables, be sure to get your own. 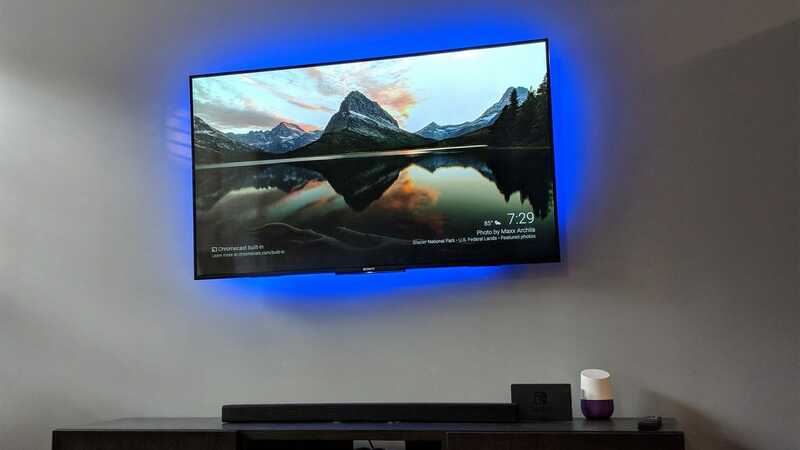 Once you install the kit, you should be able to plug your TV directly into the outlet behind it, with only a few HDMI cables running through the passthrough port down to your entertainment unit. Not only will it look cleaner, but it will be safer than the fire hazard of a tangled mess that your pile of cables is creating. Important Note: You can find behind-the-wall kits that only include the passthrough port, like this one. This is not a complete kit. Only buy this if you have an existing power outlet behind your TV, or plan to wire one up yourself. Do not run power cables through a passthrough port. In addition to being a code violation, it’s also a fire hazard. Spend the extra money and do it right. As long as the kit you buy ticks the boxes mentioned above, then you’re probably good. However, there are a couple that we recommend, especially for the novice that wants to install the kit without all the fuss. With that in mind, here are our recommendations. Datacomm also provides a handy layout for how kits like this work. This is the kit I used in my own home (largely because we had our own tools already). For $60, it features two power outlets and a passthrough port that’s plenty big enough for the four HDMI cables and the optical cable I needed to push through it. The power outlets are in a strange horizontal orientation that isn’t very friendly to power blocks, but as long as the cable from your TV doesn’t have a big block attached to it, you should be fine. If you have a cable that runs to a large power brick, I found some heavy-duty velcro was perfect for strapping that big lug to the back of the TV. At $60, it’s about as inexpensive as this project can get, but it doesn’t come with its own HDMI cables. In my set up, I found that the 6-foot cables I normally used (in addition to not being wall-rated) were too short once running through the wall, so I upgraded to the 10-foot AmazonBasics CL3 cables. 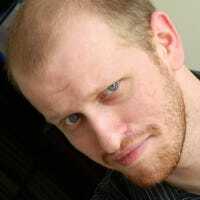 At $7.50 apiece—plus $9 for a 10-foot CL3 optical audio cable—that added about another $40 to my project’s overall total. You’ll also need a couple tools that you might not have sitting around the house. Key among them, a drywall saw is essential to cut out the hole in your wall. You might also want a flexible but rigid fish tape to help you push cables through the wall, though if the wall you’re installing the kit in lacks insulation (or if you have a comparable rigid, flexible rod laying around) then you might be able to skip this. Either way, expect to spend a little extra money if you don’t already have the tools. This kit comes in a few configurations and it gives you a lot more flexibility, especially if you don’t already have everything you need. The basic model ($70) gives you two ports next to each other with a passthrough port directly below. The port also has some brush fibers to prevent dust from coming in and out of the wall next to your HDMI cables. If you decide to upgrade, though, you might save yourself some cash. The $80 model of the kit comes with two 10-foot HDMI cables, rated for in-wall use. That makes the cables $5 a piece, compared to the $7.50 that Amazon charges for the same type of cable. Even if you need more than two cables, you’re still saving a few bucks by getting the kit. Then there’s the $90 kit that comes with the tools you need, if you don’t already have them. It includes a drywall saw and a nylon cable-puller, on top of the two HDMI cables. If you already have the tools or cables you need, this is overkill, but if you don’t, you can save yourself a decent chunk of change on this project by going this route. The kit you pick up should have detailed instructions on how to cut holes in the wall and install the boxes. These instructions can vary from kit to kit and they further vary based on the kind of wall structure you’re dealing with. 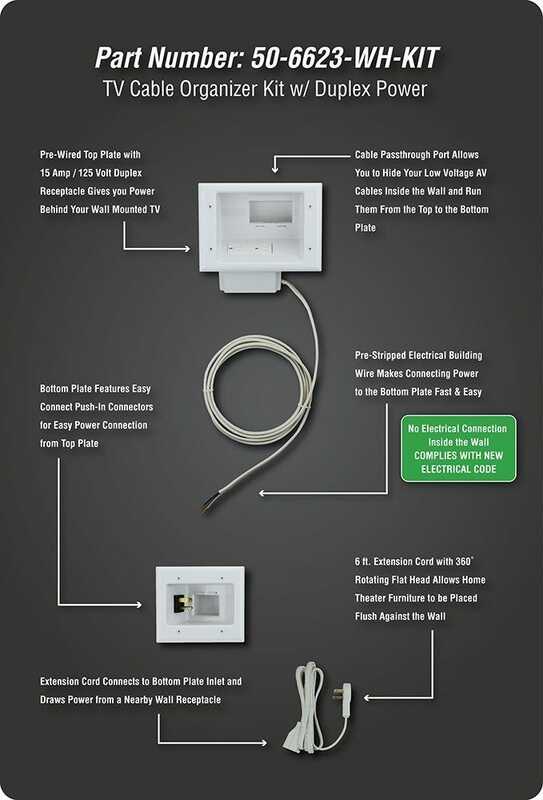 However, if you’re even moderately handy or have experience doing home improvement projects, the in-wall kit should be super easy for you to install. As always, when it doubt, have an experienced friend or professional help out. Pet cams are a convenient way to make sure your fur babies are safe (and staying out of mischief) while you’re not home. Check out our roundup of best pet cams that not only entertain and calm your pet down, but give you peace of mind.